Our carbon steel ferrules are made with modern materials and cutting-edge processes, making them ideal for use in environments where temperatures might be too high for standard aluminium or copper ferrules. 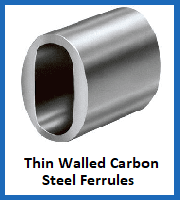 You can order made to measure carbon steel ferrules from the Rope Services Direct site. They are not just a great option for terminating wire cables in a loop formed around an eye for high temperature use; their resilience goes much further than that. 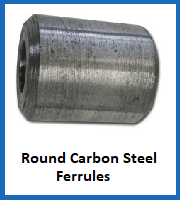 Carbon steel is a tough, reliable material that is also able to rebuff abrasions and combat corrosion in a way that other metal ferrules cannot match. 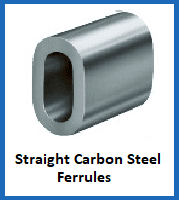 This versatility and durability makes carbon steel ferrules perfect for use in various industries. You can also order custom ferrules from this category, manufactured at our own facility, which will be tailored to whatever size or shape you require. We can even press them onto wire cables in-house, creating an assembly that is stronger and more resistant to hazardous environments. Ferrules provide plenty of flexibility, ensuring complete working safety when correctly chosen and installed. The existence of carbon steel ferrules is an example of how varied this market has become and how simple it is to create bespoke assemblies using wire rope and fastenings of the most appropriate material available. Still scratching your head about carbon steel ferrules? Get in touch with our team today and we’ll talk you through the basics. Call 01384 78004 or email us to get a quick, helpful and friendly reply today. Carbon Steel Ferrules Overall rating: 5 out of 5 based on 6 reviews.